Today’s the Day for Equal Rights in Houston!! 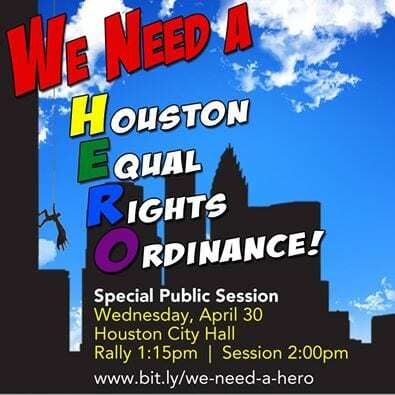 Today is a very big day in the progress towards Houston’s Non-Discrimination Ordinance (aka the Equal Rights Ordinance or Human Rights Ordinance). 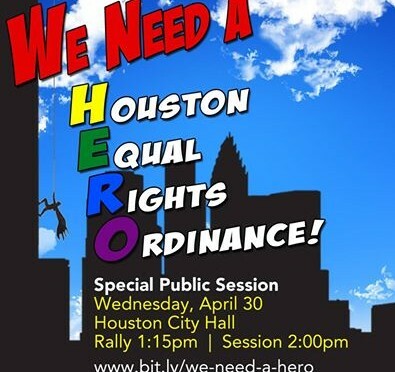 If you support equality for all Houstonians, then please consider attending today’s meeting at Houston City Hall. The Quality of Life Committee will convene at 2pm, but there is also a rally that begins at 1:15pm in front of City Hall. This session is the best opportunity for the public to comment for or against the ordinance. Even if you cannot make today’s events, there’s still time to contact your 6 City Council Members. Houston residents are each represented by 1 District Council Member, and 5 Members At-Large. As was written previously, the other side is working hard to defeat this ordinance, but they can be defeated by a clear majority of citizen support. We’re so close to making the Bayou City a better, safer city for everyone. Don’t let them win! !